H-GAC’s CRP region includes watersheds in all or a portion of 15 counties. The following is a detailed overview of basin characteristics and key water quality issues currently facing the region. Typical soil types in the region include fine clays, silts, and loams with dispersed areas of sandy substrate resulting from subtropical climate and fluvial geologic characteristics. Average precipitation rates range from 20 to 70 inches per year with evaporation rates reaching up to 60 inches per year during drought conditions. Topography ranges from just over 400 feet in the northern counties to near sea level at Galveston Bay and along the shoreline. Surface water bodies include streams, rivers, bayous, lakes, reservoirs, bays and estuaries, and the open waters of Galveston Bay and the Gulf of Mexico. Freshwater inflows from streams and rivers into Galveston Bay are generally slow due to the gently sloping relief. Many streams in the region are effluent dominated and would not normally flow year-round. Groundwater springs contribute base flow in some areas, especially in northern portions of the region where sandier sediments are more common. Riparian vegetation and wetland areas are prevalent along river floodplains and shorelines, especially in the southern reaches. Primary mineral resources within the region include oil and gas fields, lignite, sand and gravel, clay, salt, and sulfur. All streams and rivers within H-GAC’s CRP region drain into the Gulf of Mexico. The region is primarily coastal prairies and marshes continually influenced by the sea, wind, and rain. Over time, the movement of water from the inland to the Gulf of Mexico has shaped the area, creating a network of streams, bays, estuaries, salt marshes, and tidal flats rich in wildlife. Native vegetation consists of tallgrass prairies, live oak woodlands, and a variety of halophilic (salt tolerant) plants with extensive wetland and seagrass habitats providing food and shelter for numerous bird species and aquatic organisms. The highly productive bays and estuaries support a thriving fishing economy. The open bays receive a great deal of recreational activity and commercial/industrial activity, with ships and barges transporting goods through the Galveston Bay area. West Bay and southern bays are used predominantly for boating and fishing. Other popular recreational areas include Clear Lake, Moses Lake, and Galveston Island State Park. Land uses in the region range from scattered development with large acreages of undeveloped land to dense urban and industrial development. 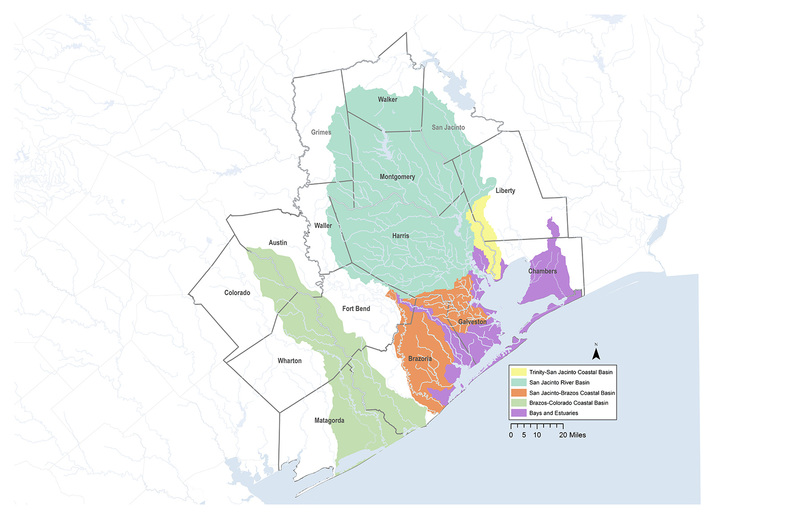 The northern watersheds drain into Lake Conroe and Lake Houston which serve as public water supply and drinking water sources for the City of Houston and surrounding communities. The San Jacinto River’s headwaters are surrounded by forests and pastures. Further downstream is more dense development from the northern suburbs of Houston through the core of the city and to the industrialized Houston Ship Channel area, thence to Galveston Bay. The southwestern portion of the San Jacinto Brazos Coastal Basin and the San Bernard River segments drain through small rural communities, industrial areas, coastal wetlands and estuaries, to bays and eventually the Gulf of Mexico. Ranches, scattered ranchettes, communities, and small towns are common in the northern watersheds of the San Jacinto River Basin but can also be found in southwestern portions of the region. Land uses are generally a combination of light residential and commercial with large acreages used for grazing or as fallow fields. 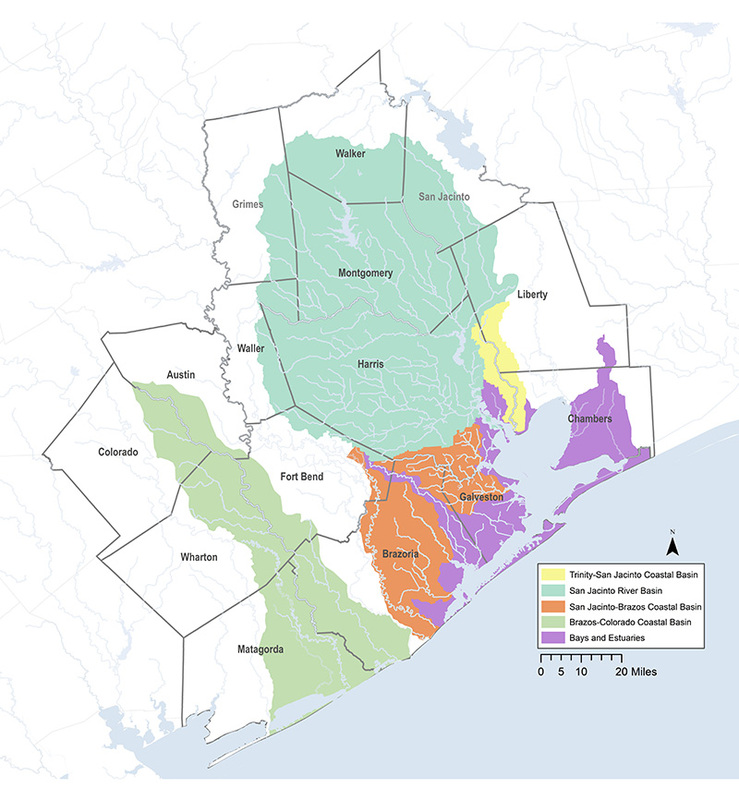 Undeveloped areas include the forests of the Sam Houston National Forest and the wetlands and coastal prairies of the Brazoria National Wildlife Refuge. Other rural and undeveloped watersheds include the Caney Creek watershed, the Peach Creek watershed, and the East Fork of the San Jacinto River watershed. Dense urban development increases as watersheds approach the Interstate 610 Loop and downtown Houston. Mixed residential and commercial uses are most dense inside the Loop, with urban development steadily expanding toward and beyond the Sam Houston Tollway (Beltway 8). Continued population growth in the greater Houston area has bolstered rapid construction of residential housing. While the majority of new housing and commercial projects fall inside the I-610 Loop within the Buffalo Bayou, Brays Bayou, and White Oak Bayou watersheds, recent improvements to Beltway 8 and State Highway 288 have led to population and business booms in Lake Houston, Pearland, and Friendswood, resulting in urban and residential construction projects in the San Jacinto River and Clear Creek watersheds. Large business districts in the region include: the Greenspoint area (Greens Bayou Above Tidal watershed near the North Beltway 8 and Interstate 45), the Galleria and Greenway Plaza areas (Buffalo Bayou Above Tidal watershed, inside I-610 Loop, north of U.S. Highway 59), and the Westchase area (Buffalo Bayou Above Tidal watershed west of Beltway 8). Other than city, county, and community parks, there is very little open space in Houston’s urban center. Some of the larger parks in the Buffalo Bayou Above Tidal watershed include: Bear Creek Park, George Bush Park (both also serve as major floodwater detention areas), and Memorial Park. Hermann Park, which surrounds the Houston Zoo, is located next to the Texas Medical Center, southwest of downtown, in the Houston Ship Channel/Buffalo Bayou watershed. Deussen Park is a recreational facility near the outlet of Lake Houston. Sheldon Reservoir and an adjacent state natural area are located just southwest of Deussen Park. Recreational activities, including canoeing and kayaking, are prevalent on the lakes as well as along Spring Creek, Cypress Creek, Buffalo Bayou, and its major tributaries. With more than 2.3 million barrels of crude oil produced yearly, the Houston region produces approximately 50 percent of the state’s crude oil and more than 13 percent of the nation’s total. More than 3,700 energy sector organizations are located within the Houston metro area, including more than 500 exploration and production companies and 150 pipeline transportation companies (Source: Greater Houston Partnership, 2015). The majority of industrial activity in the region is along and near the Houston Ship Channel: the widened portion of Buffalo Bayou from east of downtown through Galveston Bay. The Port of Houston’s economic activity has kept Texas the nation’s top exporting state for the past 13 years. Ocean-going vessels in the Houston Ship Channel are primarily tankers transporting goods and products to major industries along the Port of Houston. More than 225 million tons of cargo is handled along the 53-mile ship channel, creating approximately 1.2 million jobs and $260 billion in revenues. Major export commodities include: hydrocarbons and petroleum products, cereals and cereal products, and organic and inorganic chemicals and plastics. The top import commodities include: hydrocarbons and petroleum products, crude fertilizers and minerals, iron and steel, and organic and inorganic chemicals (Source: Port of Houston Authority). Industrial parks are located throughout the San Jacinto-Brazos Coastal Basin, extending as far west as the Bastrop Bayou Tidal watershed near Freeport. Most industrial activity is seen along the coast from Pasadena to Texas City where the Texas City Ship Channel sees a great deal of traffic for petroleum, feed, and stock products. Rapid expansion of industrial operations, including oil and gas extraction and petrochemical refineries, are currently underway in the Cedar Bayou Above Tidal and Tidal watersheds along the Interstate 10 corridor, with small towns like Baytown and Mont Belvieu seeing the greatest effects from this expansion. With more than 35 percent of land cover in the region classified as agricultural, the Houston-Galveston area is considered a major international agribusiness center emphasizing the marketing, processing, packaging, and distribution of agricultural commodities including: cotton, rice, sorghum and other grains. Agricultural production values for the region in 2012 totaled more than $1.1 billion in revenues (Houston Metro Profile: KET Enterprises Inc.). Agricultural activity is focused in the southwestern watersheds of the San Jacinto-Brazos Coastal Basin which has large acreages of cattle and other livestock grazing and land management. These activities are also found in the westernmost portions of the Buffalo Bayou Above Tidal and the Cypress Creek watersheds. The combination of land uses within the Houston-Galveston region has the potential to generate pollutants from numerous sources. Without proper best management practices (BMPs), activities ranging from industrial and agricultural processes to everyday chores, such as lawn care and auto maintenance, all have the potential to introduce nonpoint source pollutants to area waterways. Regional population growth of 3.5 million people is projected by 2040. As the region grows, close attention to the quality and quantity of our surface waters will become more and more important. Incoming residents will require water for everyday activities around the house and yard, drastically increasing water supply needs and producing larger volumes of domestic wastewater effluent. New residents will also utilize available recreational opportunities, increasing the need to ensure local waterways meet contact recreation standards. Ongoing urban development will continue to increase to keep up with population growth, resulting in more impervious cover that will ultimately generate more nonpoint source pollution from a wider geographic area. Faulty on-site sewage facilities (OSSFs), sanitary sewer overflows (SSOs), fertilizer runoff, pet waste, feral hogs, illegal dumping, and illicit discharges are some other potential pollution sources within the region. Considering the broad range of land uses, looking at pollutants on a watershed scale allows for simultaneous analysis of potential pollution sources in multiple water bodies. Through its assessment process, advisory committees, and local public input made possible by CRP, H-GAC maintains an inventory of issues facing the region’s water quality management agencies and residents.